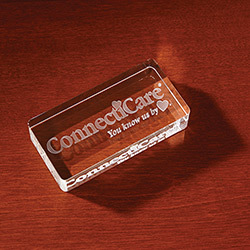 Imprint Method: UNIMPRINTED - Show off your appreciation of a job well done with our 3D Square Rectangle Paperweight Award. This polished product makes a beautiful corporate gift for employee anniversaries, retirements or promotions. For best/most dramatic results, art should be supplied as a true 3D model in a dwg file. What a great way to show appreciation. This stylish item will enhance any celebration; recognize success by ordering yours today. Size: 2.38 " x 4.75 " x 1 "